Create widgets and Web apps for the iPhone, iPad, and Mac OS X with Dashcode Dashcode is a software application that makes it quick and easy to create dashboard widgets and Web apps for Mac computers, iPhone, and iPad. Widgets and Web apps connect users with content from the Web such as Twitter feeds, movie showtimes, news updates, and more. Dashcode provides a library of graphic elements and standard code that you just drag-and-drop into your app, and this guide shows you how to use it to bring your idea to life. Learn to create, customize, and distribute your apps, even if you're a programming novice. 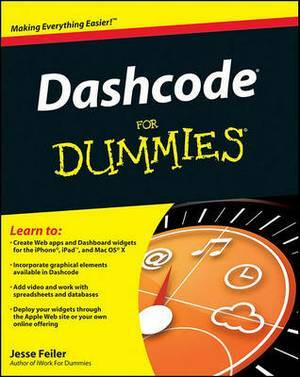 * Dashcode provides a quick and easy way to create dashboard and Web widgets for Apple devices * This guide shows you how to use the built-in Dashcode tools, including graphical elements and functional code, to create Web apps using your data * Learn to customize your app, add media, retrieve data from Web services for your app, and deploy your widgets * Even if you're new to programming, you can learn to create and distribute widgets with Dashcode Dashcode For Dummies gets you up and running with this cool tool for creating unique Web apps and dashboard widgets.